Möllers North America is a Grand Rapids-based manufacturing company specializing in bag and unit load handling systems. They design, manufacture and install palletizing, bagging, shrink wrapping and stretch wrapping systems worldwide. Their 100,000 sq. ft. facility, on 52nd Street near Gerald R. Ford International Airport, employs over 100 workers. 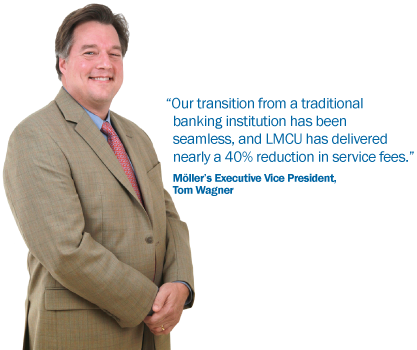 To explore the advantages and benefits of business banking with LMCU, please contact Mark Hoffhines at (616) 234-6352, or email him by clicking here.